After creating leprechaun traps, have students write an acrostic poem to describe how the leprechaun would feel upon being tricked and trapped. Use this freebie in your march units for St. Patrick's Day. 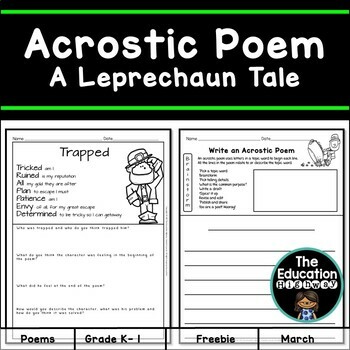 To create more acrostic poems students can use the brainstorm and draft worksheets included. Stop by and visit us for exclusive information about freebies, giveaways, and new products. Copyright (c) 2017 The Education Highway, Celeste Cuevas. All rights reserved by author. Permission for single homeschool and classroom use only.